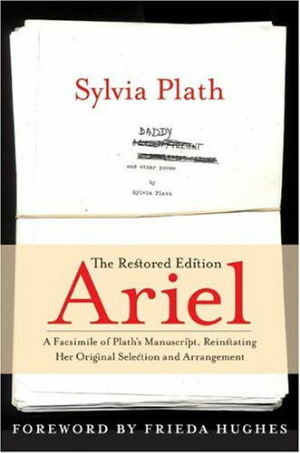 Having read The Bell Jar within the past month or so, I thought that it would be good to also read Sylvia Plath’s collection of poems entitled Ariel, after one of the poems in the book. I actually taught both The Bell Jar and a few of the poems out of Ariel to my students this year, and I have to say, they all seemed to really enjoy Sylvia Plath’s work. Plath is one of the most haunting modern authors that I have read, and Ariel truly reveals to us her haunting way of delving into the innermost thoughts that she had as well as those that we all have. Many of the poems were written about people in Plath’s own life such as her husband, Ted Hughes, her parents, her extended family, and even some neighbors. But I think they yield so much more than descriptions and metaphors describing those close to her. They reveal to us many things about Plath herself. We are led into her mind. She shows us what it is like to be her. She shows us what was going on in her mind, however strange it may be to some. Plath, who suffered from mental disorders, uses her poetry to bring out the reality and depth of what she suffered, I think. She was truly a great artist in that respect. I enjoyed reading the poems in Ariel. In fact, I had thumbed through it several times while reading other books but I had yet to actually finish it. But I sat down tonight after finishing To Kill a Mockingbird, and I read through Ariel in its entirety. It took me roughly a couple of hours since I spaced my time out by watching a bit of The Breakfast Club and playing Frontierville. About halfway through reading, I decided to have a couple of glasses of wine, and, I swear, that helped me understand her poetry a bit. I doubt she was drinking or drunk when writing them, but I think that helped clear my mind a bit while reading them. I found them to strike me in the depths of my heart and soul. I kept thinking to myself, “What does that show about me? Am I mentally ill like Plath?” I finally concluded that, no, that is not necessarily what it means. Maybe it means that I am more sensitive to people and their emotions. I’ve always thought of myself as that type. I personally don’t think you can be a good writer if you are not. So, Ariel touched me on a personal level. I think that is why it is one collection of poetry that I will probably read several times. Maybe I will learn a bit about myself while I continue to re-read it. I highly recommend Ariel to anyone who enjoys reading Sylvia Plath’s work or who enjoys reading poetry. It is well worth your time. I give it an A.